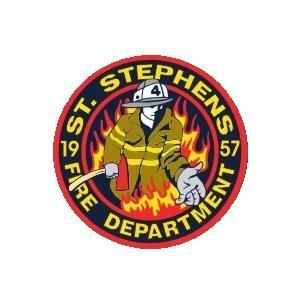 Tuesday, August 26, 2014, firefighters from St. Stephens Fire Department participated in a unique team building exercise training. 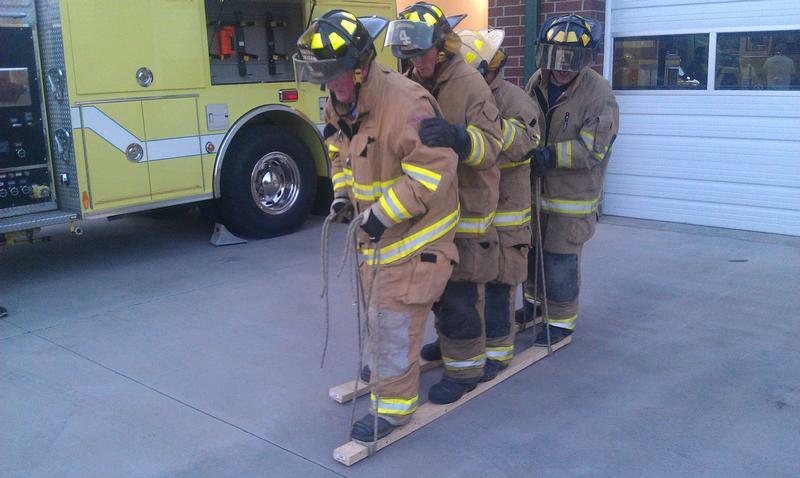 This training exercise provided us basic skills that often get overlooked. This training exercise also helped build our skills as working as a team to accomplish several tasks that may seem impossible all while building trust with fellow firefighters and practicing air consumption with our breathing apparatus. 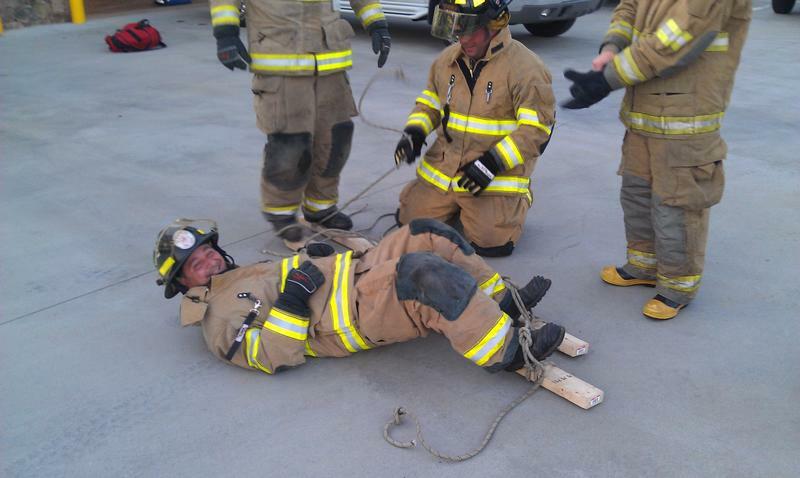 A special thank you to Russell Price for putting this training exercise together. 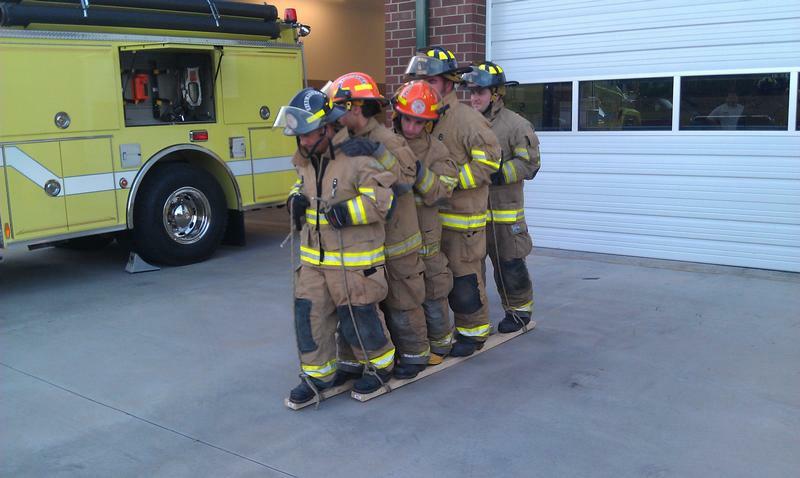 The training exercise was well received to help build morale and trust in one another. The exercise began by discussing leadership, teamwork and trust. A leader was described in several different parts. L – earn your job. E – ducate one another. A – ppreciate the effort put forth. 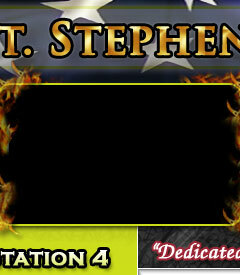 D – ouble your efforts. After discussion, the membership present was divided into 4 groups. Four stations were set up that the teams had to navigate by selecting a leader then coming up with different ideas and making a decision on how to accomplish each task. 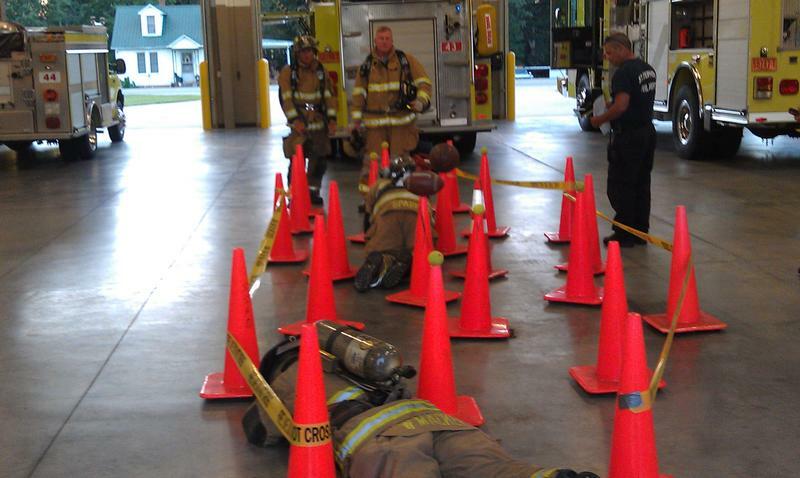 Each station was a timed event to make the drills fun and competitive all while working under pressure while wearing full gear and some events also required SCBA. The first event was called the board walk. 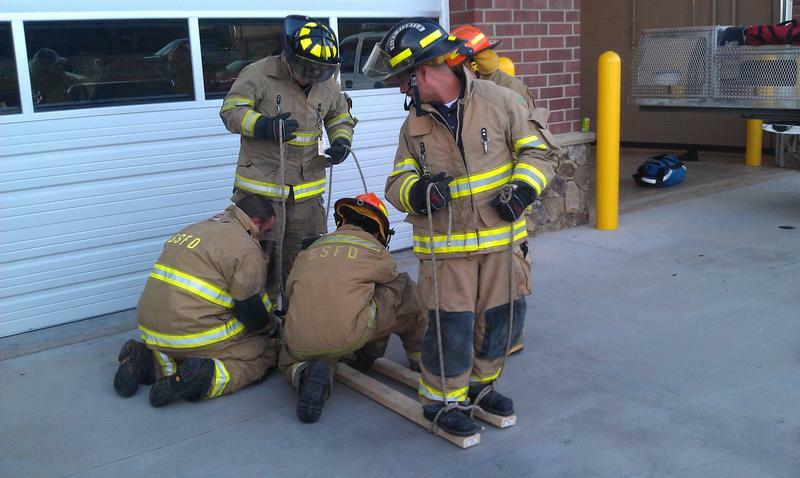 The team had two 2x4 and 4 pieces of rope to work with. The goal was to use the equipment provided to travel 30ft. without touching the ground with any part of the body. The entire team and all the equipment had to travel the entire distance to the designated spot. If a foot or any body part touched the ground, the time kept running but the team had to return to the starting point and start over. The quickest time was 1 minute and 43 seconds. Each group came up with different strategies to navigate the course. 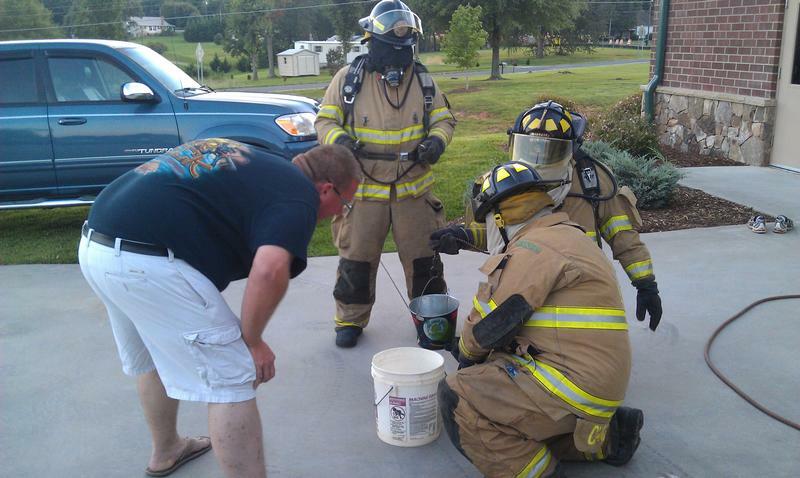 The firefighters were in full gear without SCBA for this exercise. The second event was a toxic waste exercise. The team was supplied with equipment including four bungee cords of different lengths and a piece of rope. The object was to choose from the equipment provided and remove a small bucket from the middle of a 3ft. circle that was ½ full of water then pour the water into a 5 gal. bucket outside the circle without spilling the liquid. The water simulated a hazardous liquid, and the circle was the hot zone. 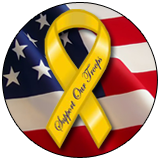 If a piece of equipment touched the liquid or the ground inside the circle, the hot zone, that piece of equipment was considered contaminated and could no longer be used for the exercise. 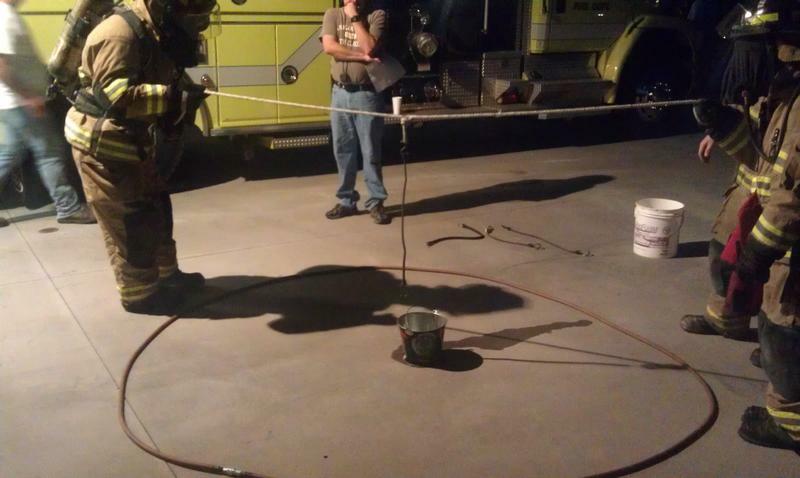 If any part of a firefighters body touched the circle or the small bucket of water that firefighter was contaminated and could not longer participate in the exercise. 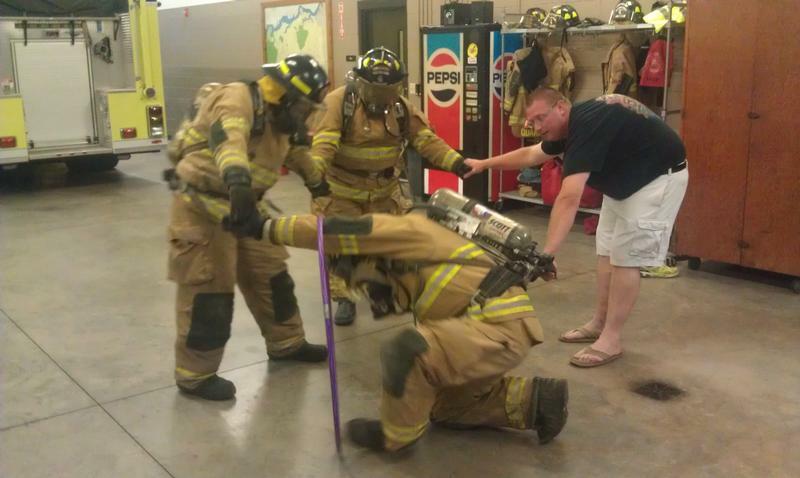 This exercise required full gear and SCBA and the working firefighters were blindfolded while a team leader outside the circle guided the firefighters to complete the exercise. Each group came up with different strategies to complete the task. The quickest time was 5 minutes and 37 seconds. The third event was a mine field. A designated area was set up 30ft. in length and approx. 10ft. wide. The area was crowded with traffic cones set up at random to act as obstacles. Some of the cones had tennis balls on top of them that simulated the mines. 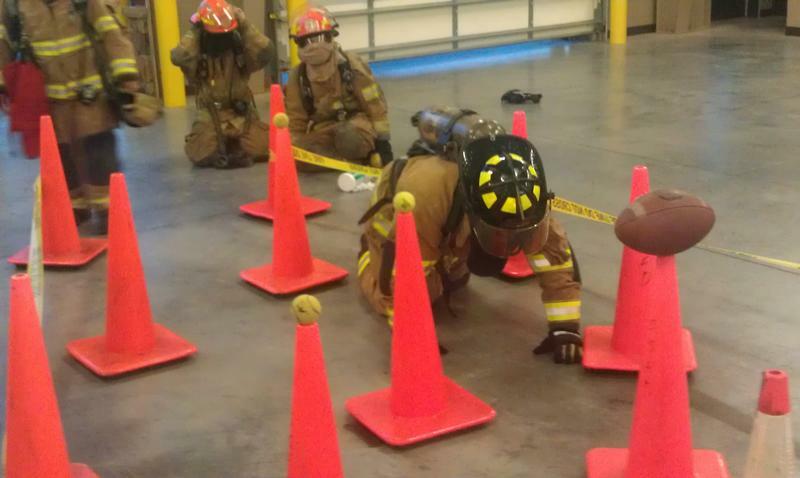 The object was for each team member to navigate the tight course without moving cones and without knocking any balls off the top of the cones. 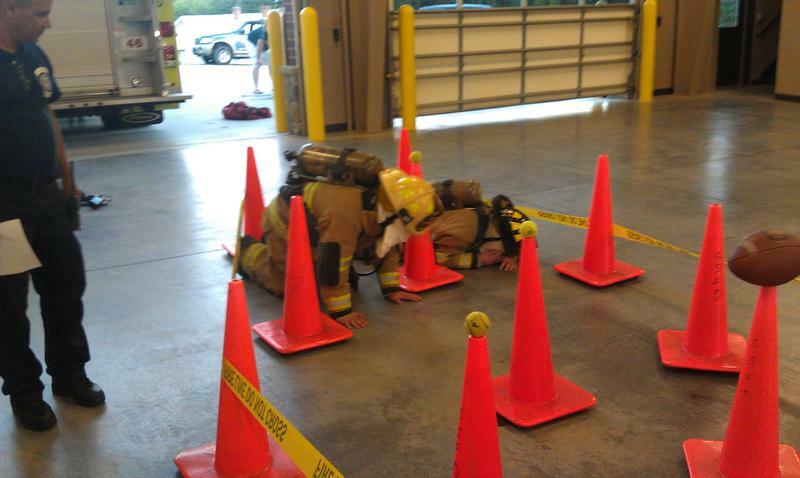 If a cone was moved out of place or a ball fell off one of the cones, the firefighter was disabled at that spot. If this occurred the next firefighter in line was to navigate the course but had to take a different route due to the downed firefighter blocking a path. 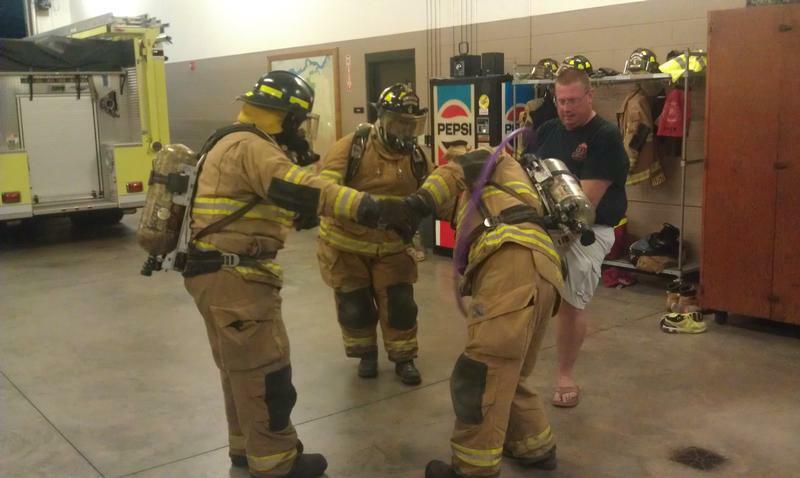 The team members went through the course one at a time all while in full gear, SCBA, and also blindfolded. 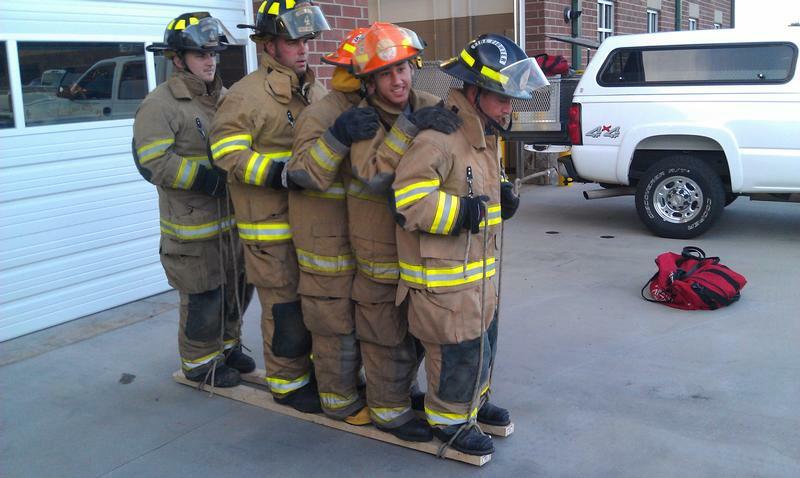 The firefighters navigating the course had to depend on a selected team leader guiding them through by using voice commands only. The quickest time was 7 minutes and 45 seconds. The fourth event was a hula hoop exercise. All team members were dressed down at the beginning of this event. 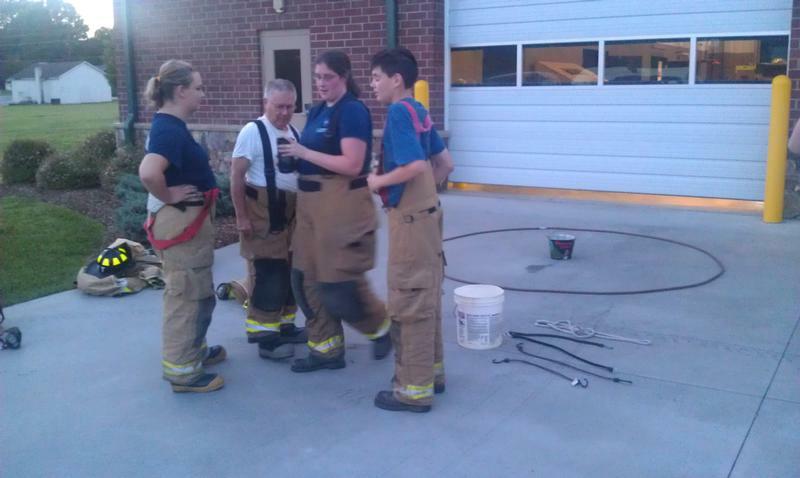 The time started when the members started dressing in full gear and SCBA. Once all members were dressed correctly for fire suppression activities and started breathing air, each team member then held hands. At this time a hula hoop was placed in position on a team members arm. Each team member had to pass through the hula hoop without breaking hands apart and without bending their arms until the hula hoop returned to the original starting point. If hands broke apart or their arms bent, the hula hoop was placed back at the starting point to start over with the time still running. The quickest time was 5 minutes and 21 seconds. Board Walk - Winning team!! !